In an industry that has constantly been evolving since the beginning of written policy, there has always been someone on the forefront continuing the momentum of change. Dennis Peron made his life’s work dedicated to making sure the cannabis movement was in constant progression. He changed the lives of an entire subculture. When Dennis passed, the world lost a man that changed the course of so many lives and history itself. 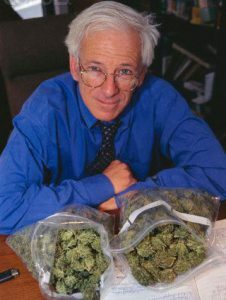 Dennis Peron is not only an extremely influential figure in the cannabis world, but also such a great example for anyone looking to be inspired. He stood up for what he believed and made sure that he fought for what was right. He is known to many as a friend, brother, and inspiration. A true pioneer to an industry that has blossomed in more ways than could have ever been imagined when Dennis sat down to write proposition 215. His efforts and hard fought fight will not be forgotten nor are they over. 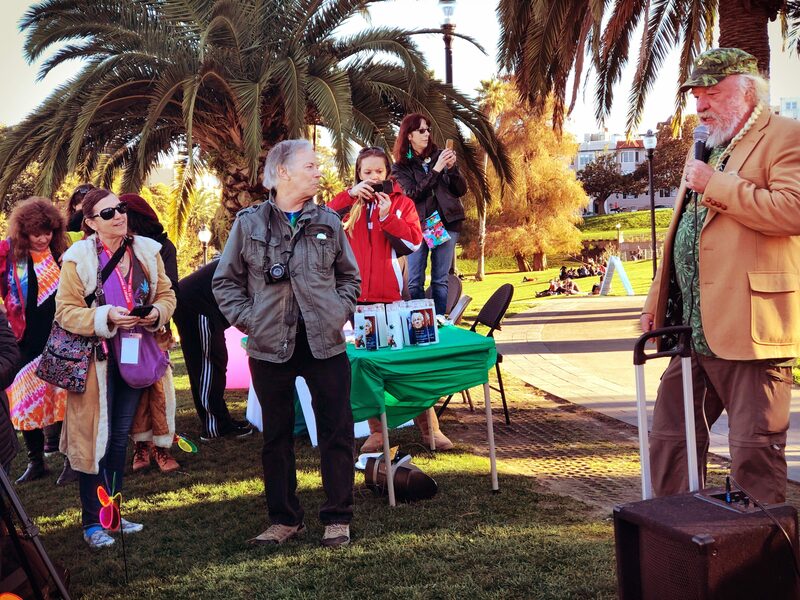 On February 15 at 4:20pm in Dolores Park in the mission of San Francisco friends and family of Dennis Peron gathered to light up and smoke in public in honor of Dennis. The day began by a gathering at the famed “Castro Castle.” It was a gardeners dream come true with greenery and so much life all around. The famed mini Golden Gate Bridge built over the this garden of wonders. It was so peaceful and beautiful and silently displayed every bit of explanation as to why it was an enjoyed space for all. Bloomfield provided flower and munchies for everyone in attendance. The joints were burning while smoke and memories filled the air. Everyone that gathered had fond memories to share and spoke so highly of Dennis. He was a true comrade and inspiration to all who encountered him. 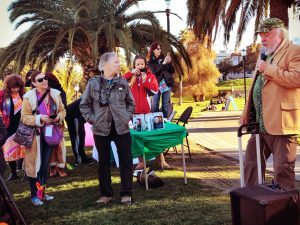 We walked down from The Castle a couple of blocks to Dolores park around 4:00 to speak about the work he had done, his personal character and integrity, and all of the life-changing inspiration he provided throughout his life. His brothers and his long time friends stood in front of everyone and told stories about Dennis being a leader from a young age and how he was always at odds with authority because “he didn’t follow the rules, he did what he thought was the right thing to do.” After the smoke out everyone walked back to the castle and smoked more and shared good times, spoke of the new policy and regulations coming, and passed around the calendars that were produced and dedicated to Dennis. Cara Cordoni, a friend of Dennis and his comrads, put together a calendar of women in the cannabis industry. With the recent passing of Dennis she has decided to take this display of power women and dedicate the calendar and proceeds to Dennis’ memorial. The calendar highlights Dennis, the Castro Castlewomen, and the reason for the calendar for the first few pages and the highlights women in the industry who have been dedicated to making reform, progressing, and staying active within the cannabis community. What: A celebration of the gay Vietnam Vet from New York who brought us Prop 215, and inspired so much more. Follow Bloomfield’s Instagram (@thebloomfieldco) for posts that give more details on the location and time of the mural dedication.